Limited to 6 people on a team ($60 for a team of 6). Members and friends of members are welcome to participate! You must be high school aged or older to play. Participants are welcome to bring food and non-alcoholic beverages for their table for the evening. 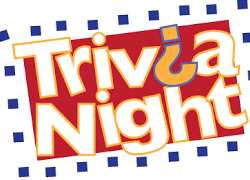 Childcare is free for participants of Trivia. If you are not playing, but your child(ren) would like to attend, the cost is $10 per child, or $25 per family. There will be activities followed by a movie with popcorn provided. All proceeds benefit the Christian Education Association (CEA) of Bethel Lutheran School.